Up for your consideration is this pair of 2 lower level tickets together to the New York Jets vs Cincinnati Bengals on Sunday, 9/1 1 at Met Life Stadium. These tickets are located in Section 137, Row 13, Seats 7 & 8. Row 6 is the first row in this section, so Row 13 is only a few rows from the field at approximately the 35yd line on the visitor sideline, offering some of the best views of the game in the entire building! This is the opening day game for both teams, with all the pomp & circumstance of opening day, possibly including fly overs after the national anthem and 9/11 tributes. If you have any questions, please do not hesitate to ask! 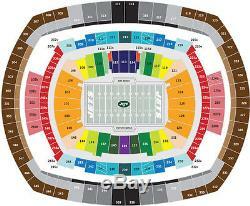 The item "New York Jets vs Cincinnati Bengals Lower Level Side Line Tickets 09/11/16" is in sale since Thursday, August 04, 2016. This item is in the category "Tickets & Experiences\Sports Tickets". The seller is "philliesphreak7112" and is located in Hampden, Maine. This item can be shipped to United States.